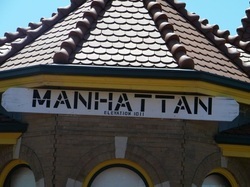 The mission of the M/RCPA is to engage the community in the active preservation of its historic resources by promoting historic preservation in the community and surrounding area, enhancing economic development through historic preservation, and educating the community as to the cultural importance of historic preservation. The M/RCPA Board of Directors meets the second Thursday of every month, 7:00 p.m. All members are welcomed to attend. January -- Jan. 10, Union Pacific Depot, 7:00 p.m.
February -- Feb. 14, Strecker Nelson West Gallery, 7:00 p.m.
March -- March 14, Strecker Nelson West Gallery, 7:00 p.m.
April -- April 11, Strecker Nelson West Gallery, 7:00 p.m.
May -- May 9, Union Pacific Depot, 7:00 p.m.
June -- June 13, Strecker Nelson West Gallery, 7:00 p.m.
July -- July 11, Strecker Nelson West Gallery, 7:00 p.m.
August -- Aug. 8, Strecker Nelson West Gallery, 7:00 p.m.
September -- Sept. 12, Union Pacific Depot, 7:00 p.m.
October -- Oct. 10, Strecker Nelson West Gallery, 7:00 p.m.
November -- Nov. 14, Strecker Nelson West Gallery, 7:00 p.m.
December -- Dec. 12, Strecker Nelson West Gallery, 7:00 p.m.